HoverCam document cameras include feature-rich, top-of-the line software. HoverCam FlexView and FlexCap are two of the most innovative pieces of software ever to be shipped with a document camera. And what’s more, the HoverCam Solo 8 document camera (as well as all other models) come with the software pre-installed and built-into the device. We are unaware of any other document camera that includes software as functional and intuitive right onto the device. Having the software imbedded in the device makes it easier to share the camera with others – you don’t need to worry about losing a CD and it’s not necessary to have an internet connection to install. HoverCam Solo 8 was awarded “Best New Document Camera” at the InfoComm 2014 conference and one of the reasons is software functionality. 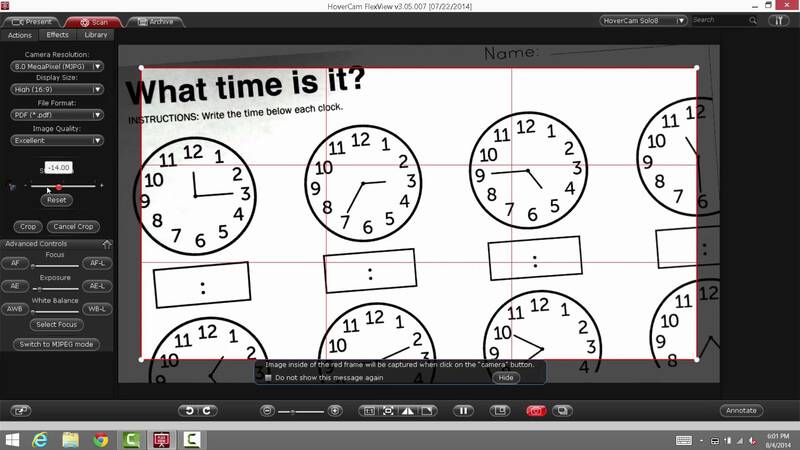 Teachers can do more and teach better with HoverCam software. HoverCam Flex software and FlexView software are written on top of Adobe Air 3.0 technology, which has allowed us to provide a user-friendly, cross-platform, powerful software experience for all of your needs. We also include cloud integration for those of you who like to backup and collaborate, including Dropbox, Evernote, Picasa, Google Drive, and we are in the processing of adding Box.net, OneDrive, and many more to suit everyone’s unique needs and desires. FlexCap software, which has been developed for the Solo 8 and for future HoverCam models including the advanced Photon Engine, is machine coded and talks directly to the camera, without Adobe Air. The advantage of the new software is faster and higher performance – for example, when you boot the new software it loads in just a couple of seconds – and greater quality control. FlexCap allows Solo 8 users to record 1080p video at full-motion 30 frames/second with annotation over USB, something other document cameras can’t do over USB. Other document cameras record at much lower resolution over USB, and with significant lag or delay. Moreover, FlexCap allows users to take stunning 8 MegaPixel photos with few artifacts. In the past, when Adobe has had a bug, it means our software had a bug. That is not the case using the FlexCap software, developed solely by HoverCam. To learn more about the flagship document camera from the HoverCam, the Solo 8, and to request a unit to evaluate free for 30 days, please visit our website at www.thehovercam.com. Compression is an important factor of high-quality video along with resolution and frame rate. Compression rates indicate how much fidelity a video has. For example, some document cameras have a 40:1 compression ratio, meaning there is a massive loss in the original image or video when you actually view it. We call this lossy compression because the video loses a lot of data and the image quality suffers. Compression is done for a variety of reasons, among which is the desire to increase frame rate. Traditional document cameras – with their limited video processing ability – use lossy compression to increase frame rate. But, poor image quality and low-tech hardware can’t be hidden by fancy tricks, compression and misleading specs when it comes to viewing the video produced, especially on a large screen. We have addressed the bad and the hidden when it comes to compression – what about the good? The best looking video is uncompressed video, such as video in the YUV format. Generating YUV video at 30 frames/sec is extremely difficult for traditional document cameras because of hardware limitations. A compression ratio of 10:1 is actually quite good, and it is arguably difficult to tell the difference between 10:1 compressed video and YUV video on a small screen. But, for the highest quality video, YUV is the gold standard, and we, at HoverCam, make sure that our products are of the highest quality. High quality video is important in classrooms and training rooms which use projectors and large flat screens that enlarge the video image. Suppose there are two document cameras sitting next to each other. One document camera has push button controls on the product. Control over the camera is limited to clicking arrows and viewing onscreen ‘OK’ buttons shown on the projector or large screen display. You’ll find it takes time to figure out how to navigate the controls and you might even get annoyed. With one well-known brand of document camera, one of our team members kept asking in frustration, “How do you record a video with this thing?” It ended up you need to hit a button on a remote control to record a video. What if you lost the remote? Now imagine a second document camera that allows you to control it with a mouse, just like you control a Mac or a Windows PC. You can pan and zoom with the click of your mouse. Of, if you are using a computer with a touchscreen, all you have to do is pinch to zoom or scroll your finger to pan. Not only is this experience more enjoyable, it is more familiar, intuitive, and works much better. You can easily move around the image without effort and take your perfect picture with just a click. To record a video is just a click. To play back the video you recorded is just a click. To upload the video to YouTube, TeacherTube or Dropbox is just a click. You move your mouse to crop around the edges of a book page appearing on the computer screen – shown live by your camera – then click the mouse to scan it directly into a PDF file. Rotating an image is a click. And all of the commands are there for you to see on your computer screen. It’s easy. Which document camera do you like better? I would venture to guess you prefer the second document camera, because it connects to the computer with a USB cable, and harnesses the power of the computer to allow you to control the camera and provides you with a familiar WYSIWYG interface – What You See Is What You Get. It has everything you want and is everything you are used to. Why should document cameras live in the past? Why shouldn’t document cameras have all the functionality of modern-day devices like tablets and smartphones? Schools don’t need to live in the past. They can have the most advanced technology today, thanks to the HoverCam. Thankfully, the HoverCam thinks differently. They use the latest, newest, most advanced technology in their products, and the Solo 8 is possibly the best document camera ever built. HoverCam has embraced the newest technology, and encourages teachers and schools to do the same. Embrace new now. Frame rate is one of most important features of any video recording device. Frame rate affects how smooth the video appears when viewing it. Televisions, computer monitors, and other viewing devices convert frame rates (frames per second) into Hertz for their devices. The motion-picture industry standard for basically all movies you see in 1080p HD and 720p is 24 frames per second (fps). In the document camera industry, a refresh rate of 30 fps is the standard for top of the line document cameras. Some document camera manufacturers claim something along the lines of “30fps max” on their specification sheet for marketing purposes. The number is misleading. Upon first impression, you may think, 30 fps great! That’s faster than the industry standard for movies. What these manufacturers do not tell you is that frames per second has a second component. Anytime you see a frames per second claim, your next question should immediately be “at what resolution?” This latter half of the question is why some document camera manufacturers use 30fps as their “max,” because they are only able to achieve 30fps at low resolutions, such as VGA or 1 MegaPixel. This is problematic for customers because with these manufacturers you either end up with choppy, blurry, video with lag, or, you have smooth video with low resolution and poor image quality. In general, most inexpensive document cameras will either achieve a high refresh rate with a low resolution, or, a low fps with a high resolution, but not both. The industry has many document camera offerings that do 30fps @ 320i or 10fps @ 720p, neither of which are going to be good for teachers or students. The HoverCam Solo 8 breaks the mold, and achieves true HD video performance of 1080p at 30 frames/second and does this over USB, something no other manufacturer has been able to figure out. The HoverCam Solo 8 has an 8-MegaPixel sensor and can produce live video images at 30fps @ 1080p full HD resolution and also record 1080p video at 30 frames per second directly to the computer. You get cinema quality video performance out of your document camera with the Solo 8.